Ask A Mission MARKET EXPERT! DESCRIPTION Fantastic Urban Loft located in the heart of Mission. If you are seeking a unique contemporary space, in a boutique style setting this unit the one! An absolutely stunning space the will impresses from the moment you enter. The main level features 18 ft ceilings, 2 storey south facing windows which floods this unit with amazing natural light on all sides. (SW corner unit) Walnut hardwood & ceramic tile flooring. Stainless steel appliances, cognac stained wood cabinets,kitchen island with raised breakfast bar. Granite counters, built in wine rack and pantry. Three sided gas fireplace and in ceiling bose speaker system. An open concept dining room leads to a large south facing balcony. A spacious foyer and 3 piece bath on the main level with a Laundry area and a Guest Room. The Upper level features a full Master suite, with ensuite, walk in closet and retreat. The property features a storage locker, titled underground parking on the first level, and a fabulous location close to 4st,17th and all amenities. 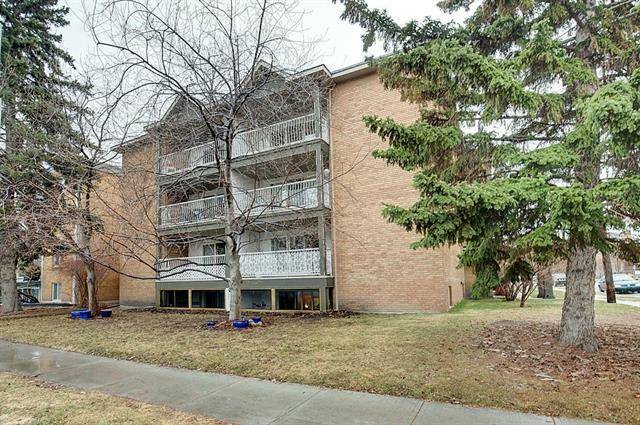 #407 317 19 AV Sw, Calgary, Alberta, MLS® C4225483 T2S 0E1 is a Apartment, 2 bedrooms, 2 bathrooms, approximately 1,128 Sq. Ft. Listing price 429,900.00. This property was built in 1981.